Want to up your marketing game in 2019? 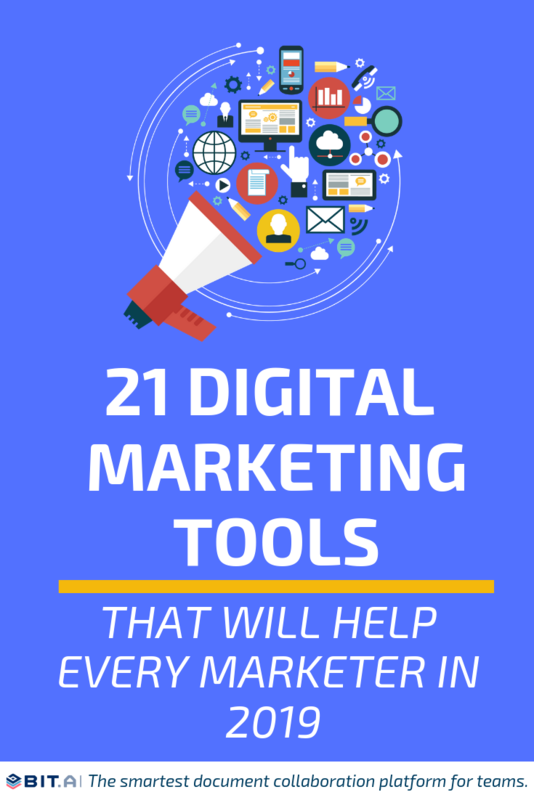 You must master these 21 digital marketing tools right away! Any business operating in 2019 is bound to have a digital presence. With your customers online 24×7 from around the world, it only makes sense to go where they are and get discovered. Digital marketing is no longer a “nice to have” or an “add on” to traditional marketing. In fact, it’s gradually becoming the most important marketing channel. Digital marketing can be defined as everything you, your brand or your company does to market your products or services to customers and prospects using digital technologies. Essentially all marketing activities that take place in the digital realm is digital marketing. One of the biggest advantages of digital marketing today is that it has helped level the playing field against marketing giants and allowed new and small businesses, an equal opportunity to fight for customer’s attention. …and it has left us all catching our breath! Phew! The good news is that with the right digital marketing tools we can all save a tremendous amount of time, energy, and most importantly maintain our sanity! Students entering the marketing world! If you are one of these people, keep your notepads ready because we are going to share a ton of awesome tools that you’re going to want to use. Are you ready? Let’s go! The go-to tool for tracking website traffic for businesses is Google Analytics. According to W3 tech, Google Analytics is used by 55.6% of all the websites, that is a traffic analysis tool market share of 85.8%! Google Analytics allows marketers to better understand their site and users. It helps with evaluating the performance of your marketing, content, products, and more. Google Analytics helps you sort, understand, and share your data quickly with an easy-to-use interface and shareable reports. With the new Google Optimize platform, integrated with Google Analytics, you can even perform A/B testing and make the best decision based on data. Next-Gen Document Collaboration for Teams & Clients. There’s no business on the face of the earth that functions without using some sort of document to create, collaborate and share. However, even though the world around us has changed dramatically, our documents still remain plain and boring. Documents today need to be multi-dimensional. As the information around us keeps growing we need more powerful tools that can adapt to our needs. Bit.ai is the first to bring documents management, creation, and insight to one platform. It’s about time you make the shift from your dad’s dated document editor, and bring all your content in one place with Bit! Collaborate & Create Amazing Graphic Design for Free. Canva also has free video training courses designed to show you how you can create better art with Canva. Canva just did a complete overhaul of their platform, with a clean new look and even more design templates for you to choose from. Canva also offers mobile apps for both Android and iOS, making it one of the best free design tools available today. Create Newsletters and Web Pages in Minutes. elink.io is an amazing all-in-one content curation & marketing tool that helps marketers and content creators publish email newsletters, web pages, and embed web content by just adding web links! Turn any web links (articles, video, etc.) into visual content in seconds. You can convert web link collections to email newsletters and export them to MailChimp, Gmail & all third-party email providers that allow HTML code (including Campaign Monitor, MadMimi, Active Campaign, etc.). You can also track content performance and engagement levels on the content you create. elink offers 19 beautiful prebuilt responsive layouts, so you never have to worry about design and can just focus on your content. This time-saving tool will change the way you create and share content. If email marketing is a part of your digital marketing efforts, you must have heard of MailChimp. Started in 2001, MailChimp has long been the industry standard for email marketing tools. Everyone- from small businesses to large retailers are making use of MailChimp to automate their marketing efforts and drive revenue. It is a great starter tool with intuitive design and easy drag and drops campaign builder. MailChimp offers hundreds of integrations with 3rd party services like Shopify, Drupal, and Woocommerce that helps streamline your workflow and sync customer data for easy access and detailed analytics. As a marketer, you need to be on top of the latest news and technological changes. A good way to be on top of all such topics is via an RSS reader app like Feedly. One of the most popular RSS readers out there, Feedly lets you organize all your favorite publications, podcasts, and even YouTube channels into collections and receive updates when new stories and videos are published. Feedly collects content from your favorite sites and packages it in a personalized magazine. This RSS reader gives you a single place for reading all of the news and content you need for powerful content curation. Marketo has emerged as one of the best marketing automation platforms with around 2,300 customers and over 100,000 active users from all over the world. On top of Marketo’s simplicity and ease of use, it is highly flexible and sophisticated, enabling digital marketers to achieve business goals. It is one of the most comprehensive platforms that can easily scale with your enterprise. With features like lead management, A/B testing, keyword analysis, customer engagement metrics, etc. Marketo proves to be a great addition to your digital marketing toolkit. More Than A Landing Page Builder. Users can also start with their marketing efforts by launching Facebook and Instagram ads directly from their landing page builder tool! The World’s Leading Experimentation Platform. Considered by many as the world’s leading experimentation platform, Optimizely empowers marketing and product teams to test, learn and deploy winning digital experiences. Optimizely takes out the guesswork by allowing marketers and product teams to test headline ideas, images, CTA’s, colors, graphics, in-code pricing algorithms and more. Optimizely lets you control how many people see your experiments and then measures their responses by segment. With Optimizely’s patented Stats Engine technology, marketers can expect fast and trusted results. Instantly See What’s Hot and What’s Not. If you haven’t heard of CrazyEgg, you are surely missing out on an awesome tool! Crazy Egg is a heat mapping tool that allows you to see where your website visitors click when they visit your pages. Crazy Egg’s Scroll Map tool shows how far bottom your website visitor has scrolled and where they abandoned your website. This allows marketers to place important information accordingly on your website. The Overlay Tool allows you to see which elements of your website are getting most clicks so that you can optimize placements accordingly. The Confetti Tool, you can see all the clicks on your website segmented by referral sources. All this information is super useful in optimizing your website and if used smartly, can convert your website visitors into customers. Software To Realize Your B2b Marketing Strategy. A big part of a marketers life is content creation, whether it’s for social media or for your company blog. This is why marketers should master Kapost, a platform which believes in the power of creating the right content for the right people and delivering it at the right time to generate more customers and sales. Kapost wants the marketing team to work smarter and not harder at producing and distributing content. Explore How Google Data Can Be Used To Tell Stories. One tool that marketers should definitely master in 2019 is Google Trends. Another great tool by Google, Google Trends analyzes the popularity of top search queries in Google Search across various regions and languages. It then displays this information using the graph for everyone to understand and comprehend. Users can also compare different keywords and search by time period, demographics, categories, and type of search including Google Images and YouTube. Whether you need validation on your idea, conduct competitive research, or see which topics are making waves amongst your target audience, Google Trends is the perfect comparison tool. Digital marketing is incomplete without proper SEO. One SEO tool that marketers should keep an eye on is SEMrush. SEMrush has all the bells and whistles of a great web analytics tool- keyword research, SEO audit, check backlinks, generate detailed site reports and more. One of the most prominent features of SEMrush is the ability to provide competitive intelligence. You can easily get analytics on your competitor’s keywords, advertising strategies, and can even do a side-by-side domain analysis. Find the Most Shared Content and Key Influencers. Find content that is most shared/liked/tweeted across different social media platforms depending on your location or time. With Buzzsumo, it gets a lot easier for you to plan and create engaging content for your target market. Learn More About the People that Matter to Your Business. One of the most underrated digital marketing tools out there is Facebook audience insights. As we all know marketing is all about knowing your customer and their preferences. With over a billion users, Facebook probably knows your customers more than you do! This allows Facebook to create tools to help marketers better target their audiences across their platform. The more customer insights you have, the better equipped you are to deliver meaningful messages to people, Facebook audience insights help marketers learn more about their target audiences, including aggregate information about geography, demographics, purchase behavior and more. If you master this tool, your life as a marketer is bound to get a lot easier. Choose The Right Keywords To get Your Ad In Front Of The Right Customers. If you are planning to run a Google AdWords campaign, you should be well-versed Google keyword planner. Integrated within Google Adwords Platform, Google keyword planner lets users add one or more keywords, choose the country and the language, and see approximately how many times that keyword is searched. Marketers can see if their desired keyword have “High”, “ Medium” or “Low” competition and what is the suggested bid for that keyword. The tool also helps in finding more relevant and related keywords for your niche. Even if you don’t plan on using Google AdWords, Google keyword planner is a great tool for deciding which topics to write on for your blog/website, thus helping you refine your content marketing strategy. A design collaboration tool, Marvel has a simple and intuitive interface which enables anyone to quickly create beautiful assets and mockups. There’s no learning curve and no software required, so everyone can get involved. Marvel provides a single place to build wireframes, prototype and design specs in one place. Users can even sync their designs from Sketch and Photoshop or build mockups directly within Marvel’s design tool with the help of millions of assets, stock photos, and icons. It’s Where The People You Need, The Information You Share, And The Tools You Use Come Together To Get Things Done. Slack is a messaging app that brings all your communication together in one place. Slack allows teams to create chat groups called ‘channels’ for transparent, open communication. In a short amount of time, Slack has gained significant popularity with over 35,000+ paid companies like IBM and Airbnb and with over 8 million monthly active users. Perfect for anyone managing a team of remote employees, Slack’s easy to use, intuitive design makes communication fun and efficient and might just cure your email troubles for good. Owned by one of the leading design companies in the world Adobe. Behance is a great platform for anyone who wants to showcase and discover awesome creative work. A popular social design platform since 2005, Behance has grown to become the biggest community of artists, designers, and creatives to get inspiration, share their ideas, get reviews and feedback from like-minded folks. Marketers should definitely keep an eye on Behance to be inspired and keep their creative juice flowing! Since every photo published licensed under Creative Commons Zero, Unsplash is an ideal resource to find awesome free stock images. Adroll is a marketing automation tool that specializes in retargeting. Founded in 2007, it is currently being used by over 35,000 advertisers worldwide. It allows you to place and monitor ads on both web, and mobile, including popular social media platforms like Facebook and Twitter. Its simplistic dashboard makes it easy for anyone to get detailed information on their ads and makes retargeting a breeze. For e-commerce marketers, Omnisend is a must-have marketing automation tool for increasing sales. Powerful enough for larger stores, and accessible enough for those who are just starting out, Omnisend lets you put a real omnichannel marketing automation strategy in place. Deep integration with e-commerce platforms means you collect critical information on customer behavior for smart segmentation and ultra-precise targeting, making sure your messages will always be relevant. Omnisend integrates with several channels for personalization: email, SMS, Google and Facebook retargeting ads, Facebook Messenger, web push notifications, and more. For sales-driven marketers who are looking for something more robust than simple email newsletters, Omnisend is definitely a tool to check out. There you have it- some of the best digital marketing tools on the planet right now. Even if you are not in marketing, these tools can help you do your work faster and streamline business operations effectively. Did we miss out any of your favorite digital marketing tools? Let’s us know by tweeting at us @bit_docs!